Season 3 of Fear the Walking Dead ended in a way that gave the new showrunners plenty of room to make changes. The Season 4 premiere wastes no time showing some of those changes by introducing us to some new characters in a new location. Since the Fear the Walking Dead episode “What’s Your Story?” crosses over with the season finale of The Walking Dead there will be spoilers for both. At the end of the TWD finale Morgan Jones has set up camp alone in the garbage dump after the war with Negan and the Saviors concludes. In the FtWD premiere we see Jesus, Carol, and Rick visit Morgan trying do convince him to leave his dump and return to the new community they’re building (which I assume we’ll see in the next season of The Walking Dead). Rick tells him “you can hide but you can’t run.” Of course Rick is wrong. Morgan packs a bag, grabs his stick and hits the road. It’s not clear just how much time has passed before Morgan runs into friendly gunslinger John Dorie (Garret Dillahunt) in Texas but now we know for certain that the Fear the Walking Dead timeline has caught up with the original show’s, at least up the point of the season finale. When Morgan and John are captured by a random gang they are rescued by Althea (a dark haired Maggie Grace) driving a SWAT assault vehicle. She tells them that they owe her. She pulls out a video camera and says what she wants is their stories. John says he’s looking for a woman named Laura who has a pistol identical to the one he’s carrying. Morgan is in full loner mode and starts to leave. The random gang catches up with the trio and a fight ensues. Morgan is wounded in the leg. The gang is killed either by walkers or the pair of machine guns rigged on top of Althea’s vehicle. Althea reminds Morgan that he still owes her a story. Morgan reveals that he used to be part of a group. When Althea asks why he left, Morgan replies “I lose people and then I lose myself.” Then he leaves again. He’s moving slow however because of the leg wound. He is almost overcome by a pair of walkers when John pops up to dispatch them with Althea and her vehicle coming up the road behind them. John and Althea are traveling together to find John’s girlfriend Laura. Morgan ends up back in the vehicle saying he will travel with them while his leg heals. Althea stops the vehicle when they see a woman on her knees in the middle of the road. Morgan is in his “I won’t kill” phase. John says he won’t kill unless he has to. Althea isn’t thrilled when the men tell her this as they get out. The woman in the road turns out to be Alicia, who puts something sharp and pointy at Althea’s throat. Nick, Luciana, and Strand emerge from hiding at the side of the road and point guns at the trio. At that point I had been thinking we might get through the whole episode without seeing anyone from the Clark Family and Friends Roadshow. With the time jump and shift in location eastward Fear the Walking Dead is looking less distinct from the original The Walking Dead. 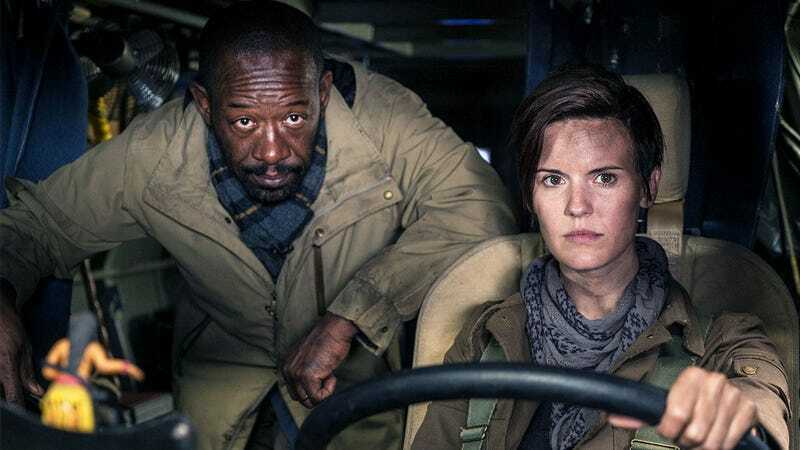 I stopped watching The Walking Dead sometime during this just concluded season (but watched the tail end of the season finale since I wanted to know what was going on with Morgan before he crossed over to Fear the Walking Dead). So I’m not sure I’m going to keep watching FtWD if it becomes The Walking Dead: Texas. Well, at least I don’t have to ask “Where’s Luciana?” this week. Obviously a lot has happened during the time jump from last season. Stand by for a lot of flashbacks. The three characters introduced on the show were all surviving alone at the start of the episode. We know about Morgan but the there must be much more to John and Althea if they’ve survived so long on their own. The white numbered flags are obviously going to be important later. For now they’re just a mystery foreshadowing what I’m sure will be something dire. Althea’s ride can’t be very fuel-efficient. This far into the post-apocalypse I can’t help wondering how she can find enough diesel fuel to keep that beast running. I guess there’s plenty in the same magic cache where she found a case of ramen (with kimchi topping!). By the way, the insignia on the side identifies the vehicle as belonging to Bexar County (San Antonio). When Do You Realize The Zombie Apocalypse Is Happening?